In June the Covenant of Hekate held a month of devotion to Hekate challenge. It was pretty free form leaving most of the details of how to do this up to the individual with the exception of the idea of 10 minutes in the morning and 10 minutes in the evening. It was here that this mediation/ rite, what ever it actually is, came forth. There were also other invisible fruits to this practice I lived for 30 plus days and still counting. This is (X ) s/he stands in the center of every storm and knows peace within her/ his heart and soul and peace within her/ his mind and body. This is the peace within (X). S/he knows peace within her/ his mind and body. Let it encompass and embrace her/ him. This is the peace within (X). S/he knows peace within her/ his heart and soul. Let it radiate and pour forth from her/ him. Watch the light from the blue candle fill its space. Observe how the light of all three candles interact. Make no judgments avoid any expectations. Let your random thoughts just slide by you without any internal commentary. When you feel the pull, extinguish all candles in reverse order being certain to thank and honor Hekate’s presence and attention. I can’t tell you that this practice of honoring my gods and goddesses is new to me. It was pretty infused into me during my training as a Feri student and carried through my initiate years. Altering the practice, though, has brought new things. This was a particular exercise in a devotion dedicated to a single goddess, giving Her undivided attention. I won’t really mention too much about the experiences I had during those moments, I don’t want to influence your own experiences or set expectations that may not apply to you. I can promise you there will be results you will be very happy with. Enjoy, and feel free to alter as needed to fit your own sense of the divine. 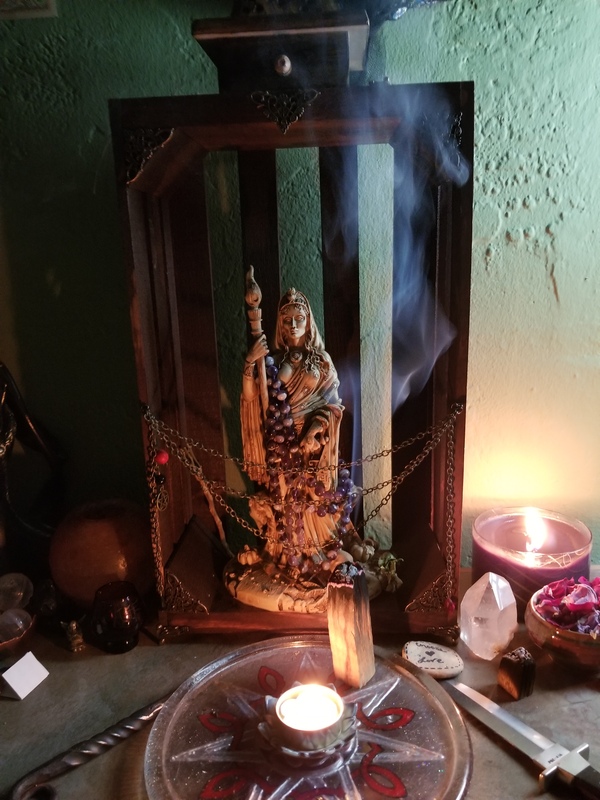 I found interesting lessons in the silences at my altar. I hope you do as well. Prev No cards for Bill. . .
Next Dear Professor Ford, the Owl is Calling . . .